The key block has two foundation sections to complete. Please update your foundation to note that patch #1 is background (not violet). When both sections are done, remove paper, then join with a conventional seam, with stitching length adjusted to normal setting. Take care that key shank and bottom of "heart" top align attractively. 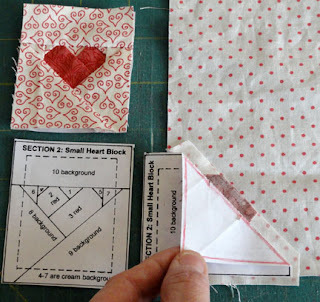 Complete one Tall Heart Block. Please update your foundation to note that patch #1 is background. Use the folding and positioning techniques described and demonstrated in February On the Docket tutorial part 1. This image shows that positioning again. Section is folded on crease for patch #5. At right the shape's edges converge into right angle corner. 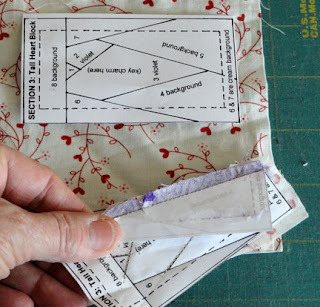 That corner can be "tucked" into the corner of the background fabric shown on work surface, shown below the folded section in the image. This assures better grain line at block edges. Complete 2 small heart blocks using different light backgrounds for each. Follow the same folding and positioning steps as for other heart blocks. Please update your foundation to note that patch #1 is background. Again you can see the corner patch #9 includes the right angle corner which can be easily placed in the correspondingly-shaped area at the corner of the fabric being added (shown benearth the section's corner). 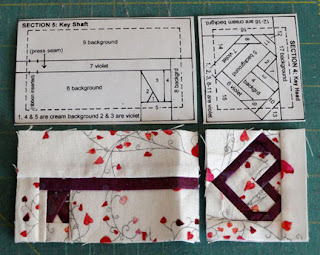 Continue the project in Tutorial #3.